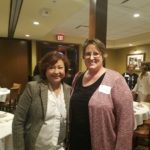 The Monson Law Firm attended The Houston Women in Claims November Luncheon! Pictured are Lilian Care with Charles Taylor Adjusting and Marjorie Salazar, Esq. with The Monson Law Firm’s Texas Office. Click here to view pictures! ~The Monson Law Firm Click here to view pictures!